We suspect this may be a good pond for yellow perch in the winter and bullheads during the summer, but with no data to go on, we cannot provide any hint as to bass or pickerel action. At the very least, however, this should be a pleasant and scenic place to spend a day dunking worms or casting poppers. A young man I met in a canoe that lives in town said he catches a lot of bass. I would appreciate reports of recent fishing catches. This gem of a lake is small but special. Named after Fort Pelham from the French and Indian War this town park and lake has hiking trails and pristine waters. Begin your paddle from Percy’s point following the shoreline along Pond Road southwest to a small cove at the outlet dam. This is an alternate put-in with an entrance to several trails. One is a Lake View Trail that follows the shoreline for one mile. For the next mile follow the shore along wooded land. There is a marshy area near the northeastern inlet (Tuttle Brook). The bottom is mucky for the most part, although there are some areas of rock and rubble. Enter the brook and paddle up to the beaver dam about 0.2 miles in. I have not paddled further. Exit the brook and follow the shore by the Town Beach and Park area. Finally pass several homes and back to Percy’s Point. Rowe is a small hill town in northwestern Massachusetts, with a population of 390. The town is one of scenic beauty, with wooded mountains, clear brooks, and the Deerfield River on its border. Rowe is close to ski areas and enjoys great hiking, fishing, hunting, kayaking, rafting and canoeing. Rowe has its own elementary school and tuitions grades 7-12 to the Mohawk Trail Regional School District and Franklin County Technical School. The Rowe Historical Society maintains an excellent small historical museum, containing antiques, artifacts and numerous photographs documenting the history of the town, including Fort Pelham (built in 1744 to guard against attacks by the French and Indians), and the construction of the Hoosac Tunnel. 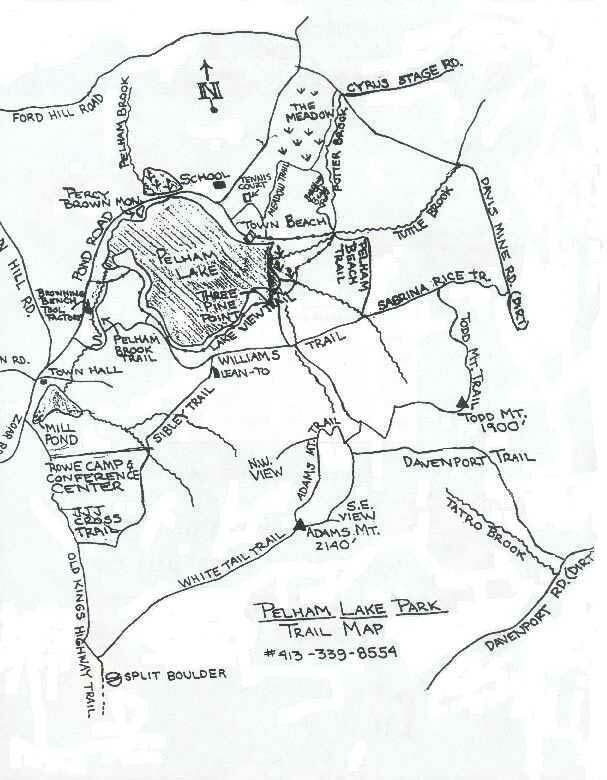 The close-knit community enjoys a solid tax base provided mainly by the Bear Swamp pumped storage hydroelectric plant located on the Deerfield River. Several smaller hydro dams and stations owned by TransCanada and the decommissioned Yankee Atomic Nuclear Power Station also provide substantial taxes to the town. For many years he preserved Pelham Lake in its natural beauty. In 1955 he presented this lake with 400 acres of surrounding land to the town of Rowe to be forever held in trust for the people of Rowe “As a town forest and park and as a sanctuary for wild beasts and birds”. His interest in Rowe, its history and legends, led him to write and publish the “History of Rowe”. (Search on-line for a free copy) He was the inspiration for the formation of the Rowe Historical Society and was the first charter life member. His great generosity and devotion to this community shall serve to inspire the people of Rowe for all time. Boat Launch: Car top carry in. Nothing over 10hp. 11 species: smallmouth bass, largemouth bass, chain pickerel, brook trout, bluegill, pumpkinseed, brown bullhead, golden shiner, white sucker, yellow perch and black crappie (calico). Put In and Take Out: 8.5 miles, 19 min. Take Route 8A North passing through Bissell Covered Bridge. At mile 4.6, turn left onto Rowe Road. At mile 7.9, turn left on Pond Road. Pass the Elementary School or right then pass the town park on left. Continue along the lake to Percy’s Point. Park and launch car top boats here. Or, continue to the outlet dam and launch there.